Historian Christopher Daley leads our audience through a one hour, in-depth retelling of the famous double homicide that rocked the city of Fall River, Massachusetts. You may have heard the ditty "Lizzie Borden took an ax....," but do you know the actual facts? Christopher has conducted extensive research utilizing archival materials, period newspapers, and period photographs to create an entertaining, fascinating and informative presentation about America's favorite "Who done it?" The story begins on that fateful day of August 4, 1892 with a striking description of the day’s events, and the murders that took place. The police investigation is recounted; the evidence, described and examined. 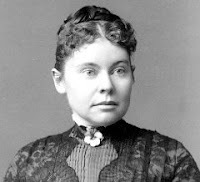 Then the focus will shift to the suspicion placed on Lizzie and her conflicting stories on her whereabouts in the house during the day of the murders. Afterwards a summary of the Grand Jury hearings and the trial using actual testimony and newspaper accounts to illuminate the proceedings. In the end different theories on the murders will be set forth and the question of "Who done it?" will be put to the audience for further discussion and conjecture.